The UK’s premiere chocolatier, Prestat, is committed to trading fairly. So what does that mean in practice? They’re currently funding a partnership between Cocoa Abrabopa and Esoko in Ghana, sending SMS messages to 1,000 cocoa farmers with market prices, weather forecasts and agricultural advice. Here, Prestat’s co-owner shares his thoughts on the intervention and the industry after a recent visit. “Prestat Bill” with Ben Gyan Kesse from Cocoa Abrabopa and Doris from CSIR. I’m Bill Keeling and I am the co-owner of Prestat which is a 112 year old chocolate company. Prestat is based in London and its founding family created the chocolate truffle. A lot has changed in the chocolate world in the last century but an awful lot has not. 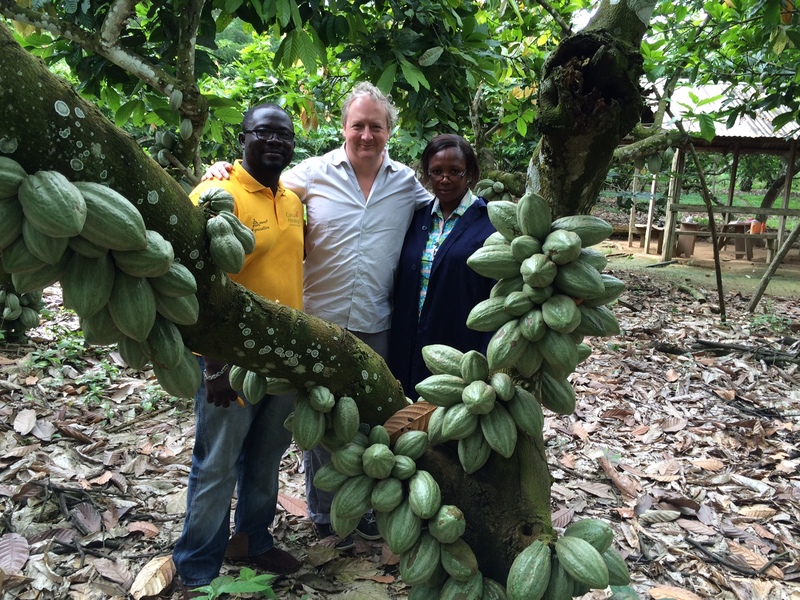 Cocoa continues to be grown mostly by smallholder subsistence farmers in West Africa and I visited Ghana to see if changes in supply chain management and information technology – as pioneered by Esoko – can result in improved farmer incomes. 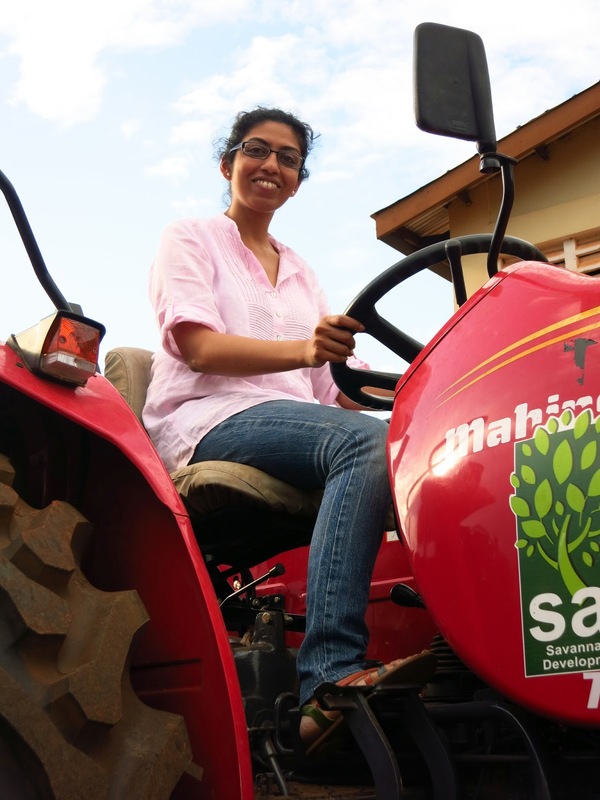 I see the challenge as transforming subsistence farms into sustainable businesses. If successful, we can take pleasure not only in chocolate as a food but in the way it connects people from rainforest cocoa farmers to consumers in London, New York and Tokyo. Every farmer needs rain, but even rain at the wrong time can destroy harvests, waste pesticides and seeds, and leave farmers without money – or options. With increasing inconsistencies in weather patterns, climate advisory services are becoming a necessity in rural agricultural communities. Esoko started many years ago building the technology that allowed organizations to send their farmers relevant prices over SMS. Though delivering prices remains a key component of our platform, we’ve learned from farmers about these more sophisticated content needs – content that will help with their production, not just their marketing. That content is focussed on localized diseases, inputs, and of course, weather. What’s voice got to do with it? 1) Farmers are struggling with using ever-more sophisticated seeds, pesticides and fertilizers; 2) Farmers depend on the rains for theirs livelihoods, and are trying to manage an increasingly unpredictable weather cycle; 3) Public extension services are struggling to keep up, with each officer in Ghana serving as many as 3,000 farmers; and 4) illiterate and semi-literate farmers, often women, need an easy to access and consistent source of information too. Brought to us by CEO Mark Davies on the heels of a trip to Burkina Faso. Technology discovers itself through use. A truism to be sure, but it really is fascinating how technology designers are educated by the unintended uses of what they’ve built. Good technologists know that the best way to improve their product is to spread it and observe, then be responsive when the market guides them. Those who seek to perfect an idea in the office and assume it will be used as intended have surprises in store. As in, we’ve had a significant number of farmers talk about how price discovery has helped them in their marriages. And last week, a farmer called our call centre for a weather forecast because he was about to plaster and paint his house. Last month I was in Burkina Faso, selecting a private partner to take over the project that was launched and run by MCA for the last three years. We decided to visit Bobo-Dioulassou in the west of the country – it’s the economic capital as well as the heart of the mango sector. I met with UNPMB (Union Nationale des Producteurs de Mangue du Burkina), a large association of mango growers that represents about a third of the industry in Burkina, or 4,000 growers out of an estimated national count of 15,000. It was a standard meeting to check in with Esoko clients so I could better understand how they’re using the platform and what services they needed. I didn’t expect to learn anything that I hadn’t picked up from other farming associations in the past, but I was mistaken. We’re thrilled to announce the $1.5 million aggregate equity and debt investment from Acumen and Lundin Foundation. They join our group of investors made up of IFC, Soros Economic Development Fund, and individual Jim Forster. Because of close to zero background in agriculture & because Esoko’s service offerings are mainly in the field of agriculture, I decided to (read as ‘forced to’) venture on this 3 days trip to Tamale. As part of the USAID accelerator program (in the Northern part of Ghana) we are supposed to interview agribusinesses & farmers to enroll them onto the program. And that’s how I got to fulfill my wish of learning a little more about agriculture. And the fact that Mark & Stephen were present throughout made it even better. Flight to Tamale from Accra was a quickie. It’s just an hour and the airport is in the middle of nowhere with I think just one air strip. Stephen (in charge of the accelerator program) who had gone ahead of us met us there and we embarked on this “trying to learn more about Agriculture” journey. I liked Tamale instantly! The town is clean and a lot greener (in comparison to Accra), roads are wide, women on their mopeds riding with such joy. The first interview Stephen arranged was with a farmer based organization (FBO) called ZOCOFFAMS (mind you, that’s an acronym and I can’t recall what it stands for, and there are plenty more to come). On our way to their office Stephen tells us that ZOCOFFAMS managed over 2000 farmers and also act as aggregators (get in touch with me if you don’t know what aggregators mean) I was for some strange reason expecting to meet this typical big shot type of person in a suit and tie, decent office, air conditioning etc. Over the years innovation has driven the development of new tools and services to tackle different areas of the agricultural value chain…now including, of course, exciting new technologies using mobile phones. All of these innovations aim to improve food production and security, the livelihoods of individual farmers, and the business of farming in general. But the majority of food production remains in the hands of rural farmers who have little or no access to these quickly moving we-can’t-wait-for-anyone technologies. So one big question remains unanswered: Why are the best technologies not reaching smallholder farmers? And how do we ensure that the technologies are relevant to the farming community and actually improving the livelihoods of farmers? Isaac Boateng (IB) and Philip Asihene (PA) of the Esoko monitoring and evaluation team share some insights. Esoko: What are some of the challenges you face out there in the field? PA: Lack of education and high rates of illiteracy are major problems. 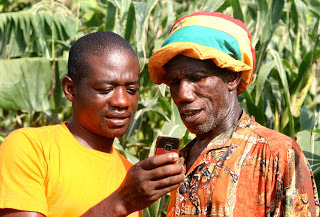 Though almost all farmers Esoko has dealt with have mobile phones and have access to phones, only a few know how to use the phones apart from making and receiving calls. Many cannot read and write and so understanding the messages we send them is difficult – some have to rely on the educated friends, children or others to interpret for them. Esoko: Do you face any challenges from the mobile network operators? PA: I think our major problem is the fact that some of the farming areas are still out the coverage areas of these networks, and some areas just have poor network coverage. Sometimes we see farmers standing at specific points in their community to get connected. Imagine the sight of about 20 people stationed at a point and making calls, checking or sending messages. This limits the effectiveness of any technology solution deployed on the mobile phone. Thanks to Talking Heads – who highlight Africans solving problems and making meaningful contributions to their communities, cities, countries, continent & the world – for our new favorite video! I joined Esoko 3 months ago. Before joining the organization, I always saw the building on my way home from school, orange and white, and tall. I thought it was a software development firm; which is not completely far from the truth. Anyways, an opening in the communications department, freshly out of a communications school, an interview and a test later I got the job as a communication officer. Now I read about Esoko before my interview (obviously), so I knew it was not just developing software and collecting data prices but was heavily invested in changing the lives of small holder farmers and helping the growth of the agricultural value chain. It was all so nice in abstract and theory. Working here, I read a lot of success stories, case studies and heard Mark Davies, the CEO and other members of the team talk about the impact we were making. I got it and yet I didn’t get it. It was all like “ok so we are changing the lives of farmers, people can now make intelligent buying and selling decisions”… all nice, but it was on paper and it was people involved in the process who were telling me this. Like you know, blowing their own trumpet and stuff… ah well it sounded nice theoretically. Three months after joining Esoko, our colleagues from our new office in Kenya came down for a visit to see how Esoko Ghana went about operations and to basically get acquainted with the platform. So as part of their visit, we arranged for Paolo, (MD of the Kenya office) and Clem (the Kenyan Sales Manager) to visit one of our beneficiary farms in Esueshia, in the Central region. When Vani, the head of Client Service told me about the trip and asked if the communications team (Garrett and I) would like to join, I was ecstatic. I was practically like a grade school kid going on his first field trip. By 2050 Africa’s population is expected to double from 1 to 2 billion and there’s growing concern about how the world will feed itself. Much attention is focused on Africa where production remains at about 20% of its potential. To try to harness this potential, dozens of technical innovations around mobile have been built both to help farmers produce more and make more money and for businesses to find African agriculture a more attractive investment. But the space remains opaque. To help the local community understand some of these innovations and learn the ins and outs about their rollout and challenges to scale we hosted the second mobile for agricultural development workshop – ‘mAGRIC Showcase 2013’ this May. GIZ was our trusty co-sponsor. The one day event brought participants from the software, agribusiness, NGO and mobile industries together. There was several presentations – the Centre for Remote Sensing and Geographic Information Services (CERSGIS) showcased an online GIS platform to assist in locating farms, warehouses, and weather stations. Farm Radio International shared how they are using radio programs to reach out to farmers, sharing information to help improve their production. They also have radio on demand services where farmers who missed a particular program can call a number and listen to a recorded version of the program. GIZ COMPACI showcased progress made with the African Cashew Initiative who are using radio programs to push forward new extension technology, as well as headway made in cotton production in Africa through the Competitive African Cotton Initiative. MOFA (Ministry of Food and Agriculture) presented the e-Extension project and its adoption, calling out the the ratio of extension officer to farmers and the rapid explosion of mobile phone usage in the country.